Zurich based AWV Informatik AG company has successfully incorporated LEDAS LGS 2D and LGS 3D geometric solvers into its ClassCAD product. ClassCAD is not a typical CAD system, rather it works as integrated environment to build end-user applications. 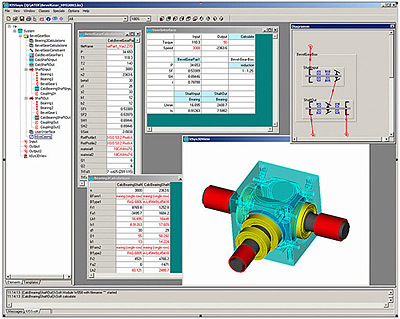 ClassCAD provides object-oriented environment for parts and assemblies modeling. It includes an integrated programming language for tasks automation within a CAD application, standalone version with visualization based on the VTK toolkit, and 3D operation based in a 3D solid kernel. ClassCAD models can be converted into feature models of other CAD systems and loaded with the plug-in version into other CAD systems. Similarly, scanning a feature model of a high-end CAD system and converting it into a ClassCAD base model is also possible. Incorporation of LGS geometric solvers into ClassCAD framework has again proved technological and financial affordability of the LEDAS solutions for small and medium companies. LGS 2D/3D is a set of C++ class libraries that runs under Windows 2000 and XP (versions for Linux, FreeBSD, and AIX platforms are available uponr request). It can be integrated (via its API written in C) into a broad range of software applications. A sample test application for LGS called Lege’n’d is also available as part of the Evaluation version of LGS 2D/3D. They are created with the Open CASCADE open-source framework. The Lege’n’d 2D and 3D applications can be used to test the entire functionality of the LGS 3D without the need to integrate the solver into other software packages. A set of representative examples for Lege’n’d 2D/3D is also supplied. LEDAS Geometric Solvers 2D/3D support creation and modification of the geometric models by means of (explicit or implicit) constraints. Typical geometric objects are points, lines, circles, planes, cylinders, spheres, arbitrary curves, surfaces and swept surfaces. Objects can be fixed in an absolute coordinate system or relative to each other (the latter feature is provided by the so-called rigid sets of objects). Set of geometric constraints includes logical constraints between geometric entities (like coincidence, parallelism, tangency, etc.) and dimensional constraints (that specify the required values for given distances, angles or radii). LGS moves and rotates objects to the positions where all constraints are satisfied by performing minimal transformations of initial configuration.